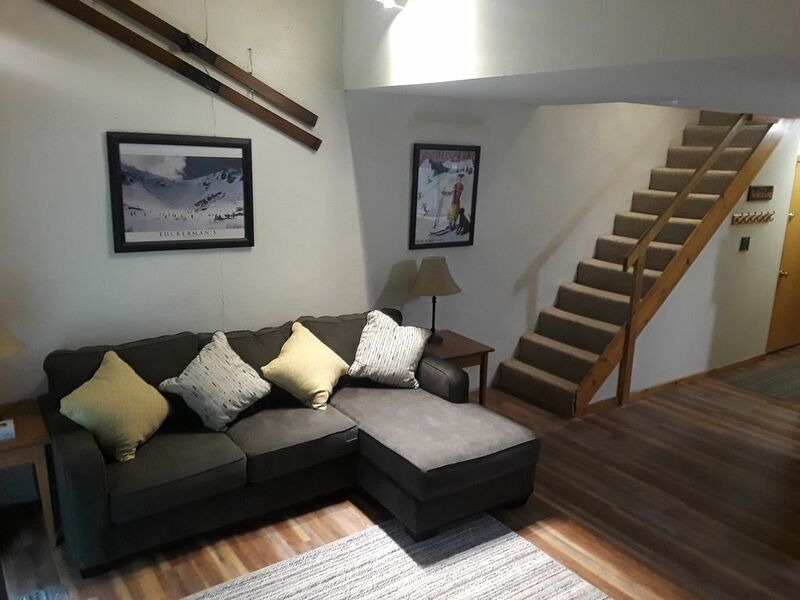 You are looking at our 2BR/2BA condo at the base of Attitash Mountain. One of the closest units to the ski lifts (about 200 feet from the slopes, located in Building 1 facing the mountain). Updates include Brand New Floors and Living Room Furniture (Summer of 2018). Great view of Attitash mountain from the condo. It is a 2-minute walk to the hospitality building with bar, restaurant, pool, hot tubs, game room. Also, short walk to Building 7 with weight/exercise room, sauna. Outside of our building is an underground walkway to cross over to the mountain/lifts. Minutes to Cranmore, Wildcat, Bretton Woods. Other mountains within driving distance include: Cannon, Loon, and Sunday River in Maine. In Summer, Spring and Fall enjoy all that the White Mountains has to offer. Walk to Attitash's water slide and alpine slide, mountain biking, mountain boarding, scenic chairlift rides. Minutes from Storyland, Echo Lake, Saco River, hiking, biking, kayaking, canoeing, horseback-riding, and fishing to name a few. Train rides are now available from Attitash. Check out North Conway Scenic railroad for more info. 10 minutes away, North Conway has some of the BEST Restaurants in the Continental US and TAX-FREE outlet shopping! The condo sleeps 6 people and is perfect for a family. The absolute greatest location at the epicenter of every attraction in the white mountains! Dear Friends, Mt. Washington Valley has been a part of our lives for over 20 years. After visiting many other places to ski and stay in the Northeast - we always seemed to come back to MWV. We purchased our condo in 2000 after deciding that this was the place we wanted to spend all of our vacations. As NY natives, we visited the area at least once during every season and multiple times throughout the winter months. There are things happening in the area all year round - not just during ski season. From the Tax Free Outlets, Story Land, North Conway, Jackson, to some of the best outdoor activities and restaurants we have been to, there is no equal; and believe us, we have looked. We loved the area so much that we have attempted several times to make Mount Washington Valley our home to raise our son; but making a living in the IT industry there was a challenge beyond our abilities and pursuing a lifelong dream of owning a restaurant was a risk too great to take. We finally relocated our entire family to Charlotte, NC in 2006 and although we feel we made the right move to improve our lives, our hearts are ALWAYS in Mount Washington Valley. We don't get a chance to visit the MWV as often as we would like, but we still try to make it up there 2-3 times a year. Our condo is our home away from home and every year we try to make improvements to the condo to make it an even more pleasant experience for our guests. We enjoy communicating with the wonderful people who will be staying at our place because we feel that it makes it a more personal experience, and it is our guests who make it possible for us to still have that connection to the White Mountains. We handle all aspects of the rental, from the first communication email, sending out rental agreements, collecting the rental fees, sending out keys and a follow-up email after your stay to ensure everything went according to plan. We encourage suggestions and comments any guest may have regarding their stay. We are also available to answer any questions you may have during your stay weather it ’s regarding how to turn on the stove, directions to ski mountain, or a recommendation on where to eat. We truly hope to one day live at our special place and fulfill our true dreams just like Andy and Elizabeth Farmer did in FUNNY FARM, but until then, please look after it for us. Tom and Angela. View from the living area of condo. Located directly across from the base of the mountain. Condo is located across the street from the lifts/ticket booths. Kitchen has coffeemaker, blender, toaster, pots/pans, bowls, dishes/glasses. There is cable in second bedroom and living area. Master BR has TV with DVD. There is a washer/dryer in the building, In the main building (within walking distance - 2 buildings over) there is an indoor Jacuzzi, outdoor winter Jacuzzi, indoor/outdoor pool, game room, bar and restaurant. In Building 7 (also within walking distance), there is an exercise/weight room for your use. There is an underground walkway to cross over to the lifts outside of our building. Minutes to Storyland, Mt. Washington Auto Road, North Conway, and all other White Mountain locations. The location was super convenient and the unit was perfect for the 4 of us and clean. Enjoyed our stay in the Condo! Perfect location. We would return again . The place was outdated and rugs on first floor were very worn. Wall in unit were stained. Place was very dated and not well maintained. Carpeting on first floor was worn and dirty. Walls were stained. Couch had an odor. No windows in unit. If I could of got my money back when I walked in the front door of the unit I would. I would not recommend this place. Very disappointed! We give every guest our direct contact information to call for any complaints or issues. We would have been more than happy to give you a full refund if the unit did not meet your standards upon arrival. That being said, we have replaced all of the flooring in the main level with high end LVP floors along with new living room furniture and artwork. We take all complaints seriously and strive to make our guests happy. We have owned this unit for over 15 years and this is the very first time hearing a complaint about an odd smell. Since we take all complaints seriously, we decided to take a trip to the unit where we found no such smell. During our last trip we replaced the main floor with high end LVP and replaced all Living Room furniture with brand new pieces. The condo needs some updating. Please see latest pictures as we replaced all the floors on the main level along with artwork and furniture. Would love to have you again. Great! Can't wait till next year! Perfect location. 5 minute walk to the slopes! Scenic chairlift rides, snowshoe trips, snowmobiling, ice-skating in town in the Ham arena. For those who are not into skiing, North Conway has countless tax-free OUTLET SHOPS throughout RT 16. You can shop all day while your friends/family ski/snowboard. There are also craft shops, novelty shops, a general store, an old-fashioned 5 and 10 cent store, the North Conway scenic railroad, parks, a museum, and many more activities to suit people of all ages in all seasons. Cancellation Policy: If you cancel more than 7 days out of your reservation you lose 20% of your deposit ($50.00) and you get the rest back ($200.00). If you cancel within 7 days of your reservation you lose 100% of your deposit ($250.00).